Fujii has been suffering from fatigue and high blood pressure. Tokyo, Japan (CNN) -- Japanese Finance Minister Hirohisa Fujii resigned late Wednesday despite a public plea by Prime Minister Yukio Hatoyama to stay in the job. The 77-year-old Fujii, a former Finance Ministry bureaucrat, checked into the hospital last week, suffering from fatigue and high blood pressure. His departure comes as the Hatoyama government is about to enter a key budget battle in the Japanese parliament, or Diet. Hatoyama had told reporters Wednesday morning that he hoped Fujii would stay in his Cabinet, saying he needed his support to help pass a draft of the budget in the upcoming Diet session, set to start January 18. Hatoyama called the budget Fujii's "baby" and said he hoped his close ally would remain to "nurture it through the Diet session." But by the end of the day, Fujii had officially resigned. 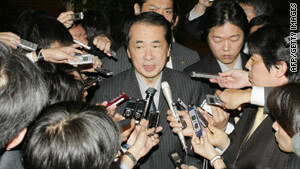 Deputy Prime Minister Naoto Kan has been named his successor. The resignation is the first of Hatoyama's administration and could signal a fraying of the government's leadership. Hatoyama's approval ratings have fallen from 70 percent to 50 percent since his election four months ago.